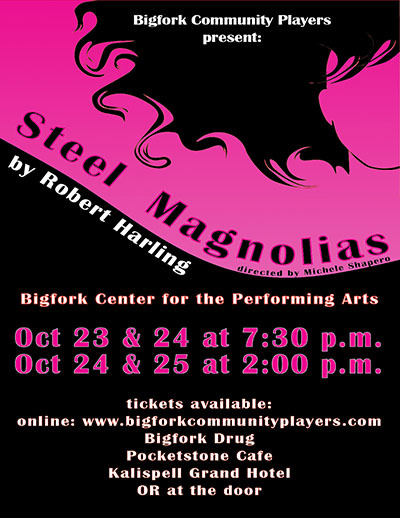 The Bigfork Community Players announce, as their fall production, Steel Magnolias by Robert Harling. In the stage version of the Oscar-winning movie, the witty repartee that fills the air of Truvy’s beauty shop in Chinquapin, Louisiana provides a penetrating view into the lives of a few women who define the character of this small, southern town. With Truvy’s guidance Annelle, a lost soul, finds her way and is ultimately saved. Shelby, the girl with something special, willingly forfeits it all for something greater. Clairee, the recent widow of a powerful man, becomes a force in her own right. Ouiser, possessed of a sharp wit and “more money than God,” provides an ongoing social commentary. M’Lynn experiences and reconciles the loss of that held most dear. And we learn that, in both the best and worst of times, in both pain and pleasure, there is comedy. Wild hilarious comedy. Saturday, October 24, 2:00 p.m. and 7:30 p.m.
Sunday, October 25, 2:00 p.m.
Click on the images below to go back.